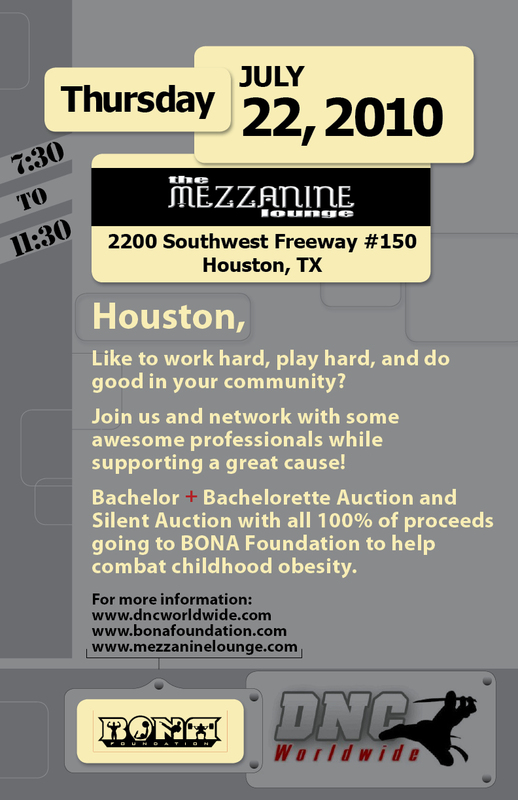 The DNC Worldwide Networking Mixer + Benefit for the BONA Foundation is TOMORROW NIGHT, Thursday at Mezzanine Lounge starting at 7:30pm! 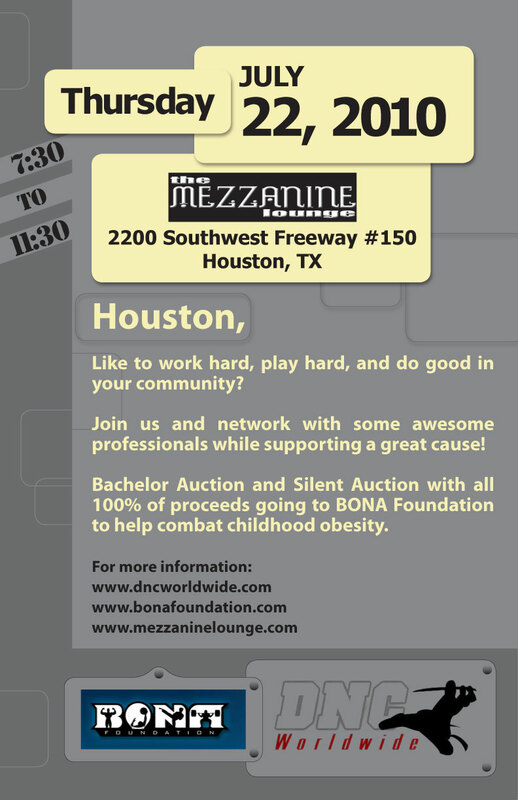 PARKING – overflow parking at Academy past Mezzanine Lounge on US59 Feeder. 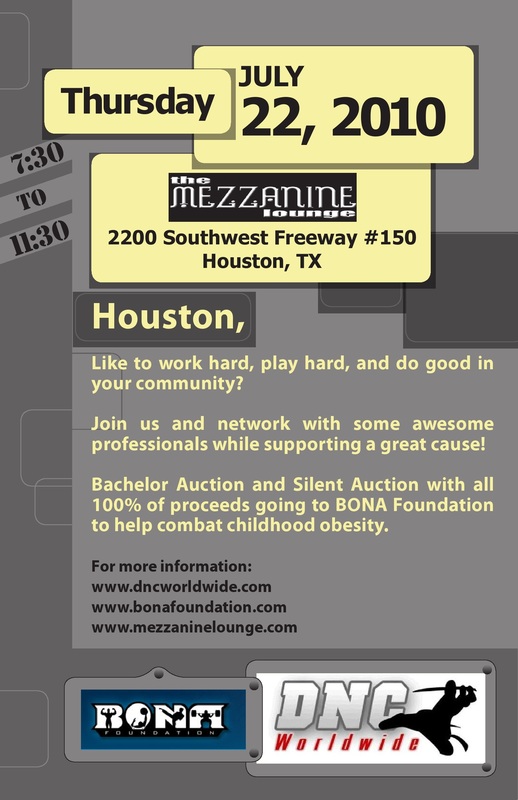 Raffle Tickets will be $2 each, 6 for $10, 12 for $20, and so on! Auto Detailing for your ride – In and Out clean w/vacuum, tire shine and glass guard from Bayou City Mobile Auto Detailing. Professional Track Drive Experience – Drive Lamborghini Gallardo on a professional racetrack at Motorsport Ranch Houston! $85 Gift Certificate to Calliope’s downtown. Conceal Handgun Course & Licensing for you and 2 of your buddies at Tactical Plus! Free tire rotation and balancing from Discount Tire. 1 bottle of wine from Spec’s. Auto Detailing for your car – In and Out clean w/vacuum, tire shine and glass guard from Bayou City Mobile Auto Detailing. Hair cut and color from Toni & Guy. 30 minute massage by Massages by Tammy. Manicure and Pedicure from Neon Nails. 1-month of free tanning at Darque Tan. With your bid, not only will you get a chance to win the eligible guy or lady of your choice – as an added bonus – your winning bid also comes with bonus gift certificates and other items! ALL of these bonus items top minimum bid amounts just by themselves! This entry was posted on July 7, 2010 at 9:01 am and is filed under Awareness, DNC News. You can subscribe via RSS 2.0 feed to this post's comments. You can comment below, or link to this permanent URL from your own site.